I now have three of these units and have some additional information. The Samsung Saturn is, basically, really bloody weird. It's a hybrid old/new model Saturn, with the motherboard from a late-model Saturn (two separate boards, one for the controller ports only) and the shell from an old model (oval buttons). According to a reliable source, Sega themselves used this same setup for the last generation of oval-button systems in Japan, so the Samsung unit is not unique. It's very possible other units, like the US version and possibly the HiSaturn and V-Saturn also had these versions. Two out of three of these units has no Japanese language option, which isn't surprising considering the ongoing irrational hostility between the Koreans and Japanese. The Samsung Saturn has a strange power supply, being the only Saturn to offer a wide range of voltage support (110V - 220V). Note: The following paragraph was more relevent when the system was believed to be the only oval/round hybrid system. Several fixes were employed to mate these two odd components. The power switch, reset switch, and both power and activity LEDs had to have adjustments made so they'd work with the old shell. Both LEDs use acrylic risers to make the light visible from the PCB (on the bottom) through the shell (on the top). While one riser was used on the newer model Japanese Saturns from Sega, none of these new-model PCBs had activity lights (though some had a place where one could go). The power switch is mounted on tall plastic legs, where on the Japanese old models they were mounted to the top half of the system, and in the Japanese new models it was mounted on a metal riser platform. The reset button, which was mounted to the top of other oval-button units, is connected to the base by a plastic stalk, like the newer round-button models. The US Saturn system from April 1996 is a HyBrid system. An oval case surrounding a “v2” 21 pin ribbon cable motherboard. All assume a US Saturn since i do not have PAL or Japanese Saturns to look at. Notes: This is probably one of the rarest US Saturns. I have owned 3 of these babies and all 3 have worked with my older 21 pin modboard. this system is the only one that is 21 pin and still has the Disc Access light and the oval buttons. You can replace the 64 leg CD-Rom unit with a 32 leg unit. Because of the rumors regarding a March 1996 unit with round buttons, i will not dismiss the possibility of a round button April 1996….i figure it's very possible, but just highly unlikely. Modboard position should be facing towards the outside of the Saturn to make this work. Controller port and LED board is a separate component on this model. This post was from a few years back on my essentially fruitless attempt to correct the misinformation regarding different models/revisions of Saturn systems. Now that the original Samsung article was updated to indicate the unit did in fact have a Reset button, I can confirm that the Samsung units appear to be Model 2.0 (probably closer to a 2.1 based on the “weirdness” surrounding the CD board and power supply) under my guidelines. On a side note, try as I might, people never really caught on to the fact that Round Button does not equal a “Version 2” system. In the original posting, “Round Button” units are marked as 3.0, 3.1, and 4.0, based entirely on the internal hardware. The motherboard used in the April 1996 units, and, by extension, most likely the Samsung units as well, have a decidedly different layout from those that came either before or after them. The Samsung Saturn. Talk about elusive. Ask Google about it. Until it was discussed on NFG Games (Pictures are also present on the linked page) it was totally unheard-of. If you don't speak (or type) Korean you'd get only a handful of pages listing company names or talking about unrelated news clips concerning the Korean electronics giant Samsung and the Saturn car company. Or you might get lucky. The occasional forum reference to the system, and in one exceedingly rare instance, a picture. Nothing more. It seems that in 1996, while LG was distributing the 3DO in Korea and Nintendo was distributed by Hyundai, Samsung had no competing game product of their own. While Samsung had previously sold a bootleg Master System (And a MegaDrive, although it is not known if this was an official or bootleg product) the Saturn was apparently licensed from Sega. (It says “Licensed by Sega” on the stickers, and the bootup images all say Sega, though this is proof of nothing). The hardware seems to be an interesting mix of both new and old model Saturn systems from Sega and licensees JVC + Hitachi. Most notable is the oval-button shell, which is the older style, combined with the smaller and newer mainboard which normally comes with a round-buttoned shell. Some more interesting notes about this system: Updates Below! There is no Japanese language option in the setup screen. No Korean option was added, just the Japanese was removed. There are no other apparent changes to the bootup menus. 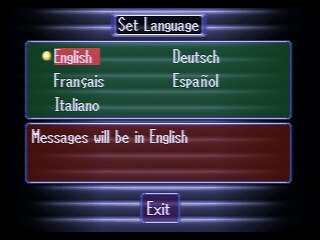 Some systems DO have Japanese. Go figure. The first system I had used an oval-button reset switch that couldn't reach the button on the PCB, which was normally connected to a round-button switch by a long post. There was no post. Two other Samsung Saturns DO have a post, so the reset switch does work. In the oval-button Saturns there is normally a PCB connected to the top of the system, to which the lights and switches are attached. Since the Samsung units have new-style guts, these little PCBs are no longer present. Therefore, the old info that this system had no reset button seems to be incorrect. The power switch is mounted on two tall plastic legs on the bottom of the shell. All other oval button models have the power switch mounted directly underneath the button on the top of the shell, and round-button models have a power switch attached to a metal riser platform, not plastic legs. The CD mechanism has two small bundles of wires in addition to the data ribbon, which is unusual: normally the newer mainboards had only one bundle plus ribbon, so again there's a weird combination here. The oval button system has always had two LED indicators on the top of the shell: One for power, one for drive-activity. This unit is no different, except it is! The top of the shell has a rectangular indentation for the LED to be inserted, (seemingly with a small sub-PCB that isn't present in this model) but uses an acrylic riser to focus the mainboard-mounted LED through the panel hole, some 5cm away. In the other, new-model systems (round-button units) the riser at the top is round and pokes through the shell, in these systems the riser ends in a rectangle shape that fits into a slow and shines through - but does not poke through - the little panel on the front of the system. The previous statement that this system has no power light is not true. The activity light is the same as the power light - an acrylic riser is used, and slotted into a rectangular hole, and shines through the cover. This is unusual again - most round-button systems with the new smaller PCB don't have activity lights. It's well known that the Korean electronics industry a few years ago sucked rather a lot, not unlike the Japanese way back when. It seems to me that the Samsung Saturn is a half-assed half-finished system that was simply rushed out the door. My guess is Sega dumped this hybrid, half-old and half-new system on Samsung without paying much attention to it. All three of the systems I received have been in poor condition. Screws are missing, parts are missing, and so on. I wouldn't be at all surprised to find that the Samsung Saturn was junk from the beginning, though it's possible (and just as likely) that the three units I received were not taken care of by their owners.